The chokeberry (Aronia melanocarpa) is a flower-bearing shrub which is part of the Rosaceae family. This shrub originated from North America, where is grow next to the forests, in wet areas, or around swamps. 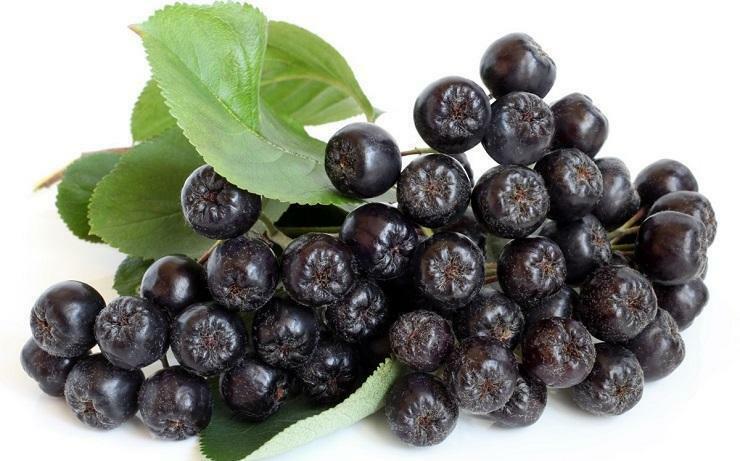 The chokeberry has earned everyone’s attention as its fruits are powerful antioxidants and rich in vitamins. Its fruits help our bodies fight heart diseases, prevent aging, offer protection against the UV rays and aid our immune systems. The chokeberries also have a powerful antibacterial effect. The chokeberry is not only cultivated for dietary purposes, but also for decoration purposes. It grows as a rustic shrub, with a bush look, 1-1.5 meters high. Its foliage is composed of many branches (15 to 60). Its stems have a brown-gray color, the sprouts are elongated and have a red color. The fruit bearing formations grow on the branches that are 2 to 4 years old. The leaves are simple, with serrated edges and an elliptical shape. Their dimension ranges from 3 to 6 cm, darker on their superior side and hairless. During autumn, the leaves turn into an intense red color, which also increases their esthetic value. The flowers are white, grouped into corymb type inflorescences. The flowers bloom during April – May. The pollination is entomophilous, this is a honey plant. The fruit is a drupe, juicy, black or red. 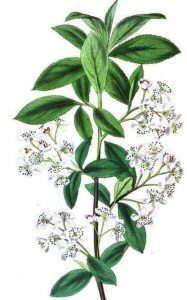 The chokeberry is capable of adapting to various soils, including to the poorly acid and clay ones. It does not like the calcareous soils. The recommended pH needs to range from poorly acid to a neutral one. The chokeberry is resilient to frostbite, and it won’t be affected by a few days of drought. If the soil’s humidity is not correct (irrigations and rains), the fruits will become dry and will lose all their properties. This is a light loving species, and it needs as much solar radiations during the day as possible. It can also grow on a semi-shadowed environment, but the production will be considerably decreased. For this crop choose relatively isolated parcels, which are paced at least at a 500 meters distance from highly frequented paths and at a minimum of 12 km of industrial polluters. 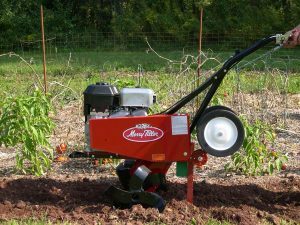 The soil must not have any pesticide, residues, nitrite, heavy metal residues, or any other residues. The parcel’s gradient must not be higher than 10-15%, the ridges must not be exposed to landslides. This crop has increased productions on soils whose pH ranges from 5.5 to 7.5, which are rich in hummus, with a middle texture. These shrubs must not be planted on saturated soils, on excessively humid soils or on rocky soils. The chosen parcel must have all the previous crop’s remainings removed, the soil will then have to be ploughed at a 18-20-cm depth. After one month from taking these out, base fertilizers can be applied, using 30-40 tons of organic compost per hectare. The basic plough needs to be carried out after this, at a 30-40-cm depth. 2-3 weeks after this, the soil needs to be minced. 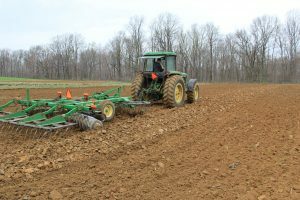 The optimum planting period is during autumn, at the beginning of November. If this cannot be done during autumn, it can also be done during the early days of spring. 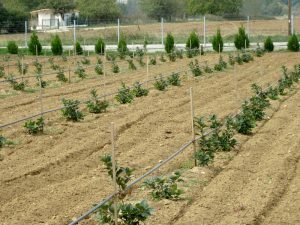 The following planting scheme is recommended: 2.8-3.5-meters distance between the rows and 1.2-1.5-meter distance the plants on each row. Once the needed planting scheme has been set, the soil must then be marked. You can do this by sticking a stake where each shrub needs to grow. The following procedures need to be digging the holes and planting the chokeberry seedlings. The hole can be dug either manually or mechanically. These need to be 40 x 40 x 40 cm. Pour around 10-15 kg of manure in each hole. Right before planting, the roots need to be cleaned. You can do this by cutting off the wounded areas of the roots. This also makes the plant’s root system younger. The dead roots must be completely taken out and the living ones must be kept at a length of 10-15 cm. once the roots have been cleaned, they need to be placed inside a mixture of yellow soil, cattle organic compost and water. This will help the shrubs better adapt to the new environment conditions. The above-mentioned mixture must have a cream-like consistency. The planting phase needs to be carried out by 2 people, so that the entire root system fits into the holes, as well as 4-6-cm of the shrub’s stem and the plant is placed into a vertical position. The first person can hold the plant into the recommended position, while the second person covers the hole and lightly presses the soil surrounding the shrub. After planting, create an 8-10-cm high anthill around the plant. 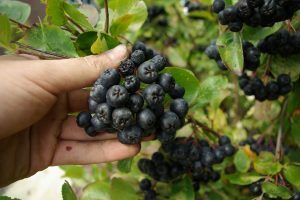 The most common chokeberry species are: Nero, Melrom, Viking, Amit, Hugin. During the first 3 years from planting, you can pay extra attention to taking care of the soil. This must be kept clean by repeatedly ploughing the soil, mulching it, milling it. Starting with the third year, if the weather and soil conditions allow it, the spaces between the shrubs can be planted with white clover (Trifolium repens). This species will not affect the shrub’s water and nutrients requirements. The white clovers must then be periodically mowed, the hay must be left on the soil to help carry out the mulching process. The fertilizing process must be carried out using organic fertilizers (organic compost, etc.). Apply 30-40 tons per hectare once every 3-4 years. The fertilizers must be well incorporated into the soil. The optimum fertilizer applying period is from November to February. Apply 20 grams of ammonium nitrate per plant every year. This needs to be done during spring. The irrigation is an important process for the chokeberry crop as it helps the plant grow and withstand longer drought periods. Normally, the irrigation process consists of watering the crop 4 to 6 times per season, using 300-400 cubic meters of water per hectare. Sprinkler irrigation, drip irrigation, or surface irrigation can be used. This is a very important step in the chokeberry’s crop technology. 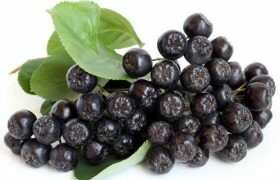 For more information about the diseases and pests which affect the chokeberry crop, along with information about the proper prevention means, please click here. The applied cuts are mandatory for the gooseberry crop. This is recommended as it helps you maintain the crop and it favors the fruition. The cuts applied during the first vegetation year are necessary as it form the shrub’s foliage. The gooseberry has a large sprouting capacity. This characteristic helps the shrub in rapidly forming its foliage and periodically rejuvenating its branches. We recommend helping the shrub grow as a bush. For this to happen, choose 5-8 vigorous branches as these will represent the main branches of the shrub. Take out the other growths. Fruit bearing sprouts will grow on the main branches. During the vegetation period, you must take out all the sprouts located at the base of the shrub. The shrub must then be cut annually, to air it and help it grow fruit. After every cut, the foliage must be aired, left with 5-8 main branches and 2-4 young branches which are evenly spread throughout the shrub. After 10-12 years, the shrub will enter a downfall period. This is when many rejuvenating cuts must be applied. The old branches need to be taken out first, followed by the wounded ones and the ones which have been affected by the frostbite. The branches that grew from the main branches need to be cut, leave only 2-3-year-old branches. The maintenance cuts need to be applied for 3-4 years. The chokeberry is a precocious species, which bears fruit during the second vegetation year. Its fruits need to be harvested at the end of August, beginning of September. Its fruits can be stored for a long period of time. If the chokeberry fruits are intended for industrial use, then the harvesting process must take place during the middle or the end of autumn. By processing these fruits, we can get juices, jams, or phytopharmaceutical products.